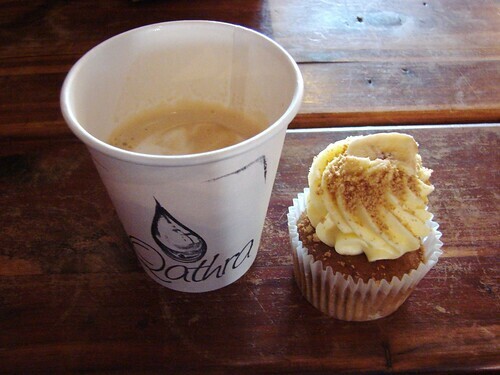 Qathra with their delicious coffee, spacious back patio and free wifi is a much welcomed new spot in the nabe. Add Robicelli's cupcakes and you might find me holed up there for a good long while. This week Robicelli's has a fantastic sounding "STRAWBERRY RHUBARB CRISP" Oat cake, vanilla buttercream, homemade strawberry rhubarb compote, oat crisp. And it's available this week only, then back in the vault til next spring! I've got to get over there for one of those! Well done Qathra! I'm so glad Robicelli's is back in the neighborhood! I was very sad when they stopped selling them at Market! Silly Market! Yes! I'm glad they were able to find a new home quickly!